Units: 1 micron (um) = 39.37 microinch (u-inch) = 1000 nanometer (nm). Surface roughness is one measure of the texture of a surface. 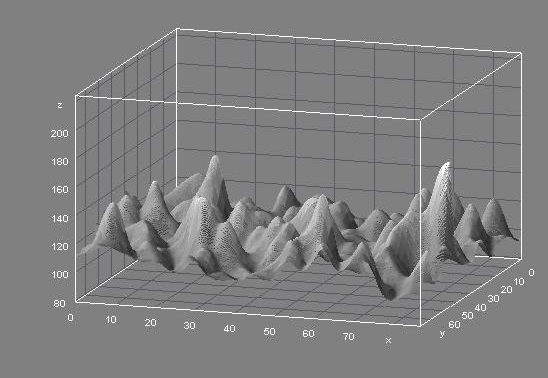 Several other measures are also important like the Autocorrelation distance, Str (anisotropy), Surface density, Skewness, Kurtosis and volumetric measurements. The assesment of of texture depends on the resolving power of the probe employed. In an approximate sense, the resolution of the human eye is about 0.3 mm. The resolution of an optical light microscope is ~500 nanometer (nm) spatially and about a micron in the height direction (confocal microscopy provides a smaller height measurement possibility). In a scanning microscope it is about 10-100 nm depending on the electron wavelenght. For a transmission microscope it could be less than 1 nm. For an atomic force microscope it could be 0.2nm. or reported with a Rq number (root mean squared RMS value of roughness). More advanced reporting procedures include values for waviness, kurtosis, and surface skewness, ACL and Str; however Ra and Rq capture the height roughness adequately. Units: The engineering units for both Ra and Rq are either microinch or nanometers. Peening or burring is the process of working a metal-surface to improve its material properties. Ion peening with the e-Ion Plasma is a relatively new processes that can be used for curved and complex shapes. Cast surfaces display Ra of about 50-250 u-inch. Sand castings display the higher roughness, plaster shell type investment castings and die castings show the lower values of roughness. Squeeze castings also display a higher average roughness. Surface roughness can change the look-and-feel of products (gloss and luster) as well as the friction and wear properties. An inadequate roughness can effect the durability, fatique, bio-compatibility and reliability of the processed part. Cascade e-ion information request. Several quick machining operations leave behind burrs. Roughness impacts life by impacting wear resistance, erosion resistance, fatigue resistance, creep-fatigues interaction and other material design parameters. Roughness is called out for metallic, composite and ceramic parts used in turbo machinery, combustors, engines, cylinders and other engineering parts. For polymeric and other soft surfaces the more commonly reported measurement number is related to specular reflectivity, the Ra and Rq are generally not called-out. A bad casting finish can dramatically alter the energy efficiency in any fluid flow device e.g. a pump or turbocharger. High roughness can cause turbulence. Roughness can be controlled with e-Ion techniques. For more information regarding surface roughness and surface finishing, see this site which discusses how coatings fill the voids between sand grains and can also act as a refractory, limiting the defects and loss of integrity that can occur with higher melting point alloys. Make casting surfaces harder and smoother. The cascade e-ion is a cost effective method of altering the texture of a surface and thus altering several engineering properties including friction and wettability. Prevent slip-stick, improve color and luster. The Cascade e-ion Plasma is a versatile machine that may be used to impact the surface texture and roughness for metals (Cascade e-Ion source), ceramics (Cascade e-Ion EIZ) or soft plastics (e-Ion LIP). With the e-Ion Plasma machine one may rapidly "deburr" or create new surfaces, depending on the ions used and other properly set conditions that change for specific alloy surfaces and temperature. Contact the manufacturer, MHI. Nano scale features of texture and porosity that are now known to be important for surface bioactivity or roughness can nowbe engineered. Sometimes trial and error experimentation may be involved regardless of whether a titanium, steel, cobalt or PEEK alloy. In its several modes the e-Ion Plasma™ can deburr, ionic co-deposit to alter surface porosity and be used simultaneously for thermal action in various combinations of use modes to obtain the best surface. Numerous studies are underway for smoothening glasses, semiconductors and high hardness materials such as carbides, nitrides and borides. Selective smoothening or roghening studies with composites and muticompositional alloys are underway also. The initial surface conditioning plays an important and non-intuitive part in the surface action. Every competitive "deburring" process has advantages and disadvantages. When comparing processes for a particular action, the comparison should include speed, reliability, tolerance, energy efficiency, chemicals and other environmental foot-print features including noise for comparison making. Mechanical processing (such as drilling, grinding, stone-tumbling and polishing) may change or damage materials on account of focused stresses which then may lead to residual cracks, residual tensile stresses and/or changes in the microstructure; thus reducing the service life of the part. Electro--polishing may require chemicals that need to be stored, replenished and disposed. The e-ion on the other hand uses only air (or other gas of choice) and electricity as input to the machine. High kinetic and thermal energy ions are used for deburring in the e-Ion Plasma process. It is a noiseless yet controllable process and because of the small foot print of the cascade e-ion device, may be used on a table-top for almost all configurations. 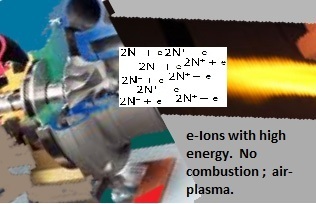 The Cascade e-Ion Plasma™ i.e. the CleanElectricFlame® can be used in a continuous manner with a belt or robot part-handler. MHI provides all the high temperature holding accessories required by the user for addition to a standard part manipulators. See also welding page. Although not all the benefits of a new technology like the e-Ion Plasma can be known at this point, several benefits may be anticipated. For example, with the e-Ion Plasma, the rapid "deburring" step can be thought to be combined with a rapid surface niriding and bulk sintering step. The ions do not require line-of-sight beam and the product does not have to be electrically grounded. This type of sintering is called 4DSintering® which is a Trademark of MHI Inc. Simultaneous ion peening operations can be envisaged. Similarly welding and weld smoothing may be anticipated as simultaneous operation. The scale from welding and the chromium depleted layer underneath the weld roughness must be normally removed for example for improved stainless steel, sea-side corrosion resistance. Mechanical polishing to match the finish on the parent material is often used but this must be done carefully so that cracks are not introduced which can lead to stress-corrosion cracking. More Online Information. Sometimes surface roughness is further reduced by deposition. The e-Ion depositor attachment may be used with the same machine. Example: Starting from surface with a Ra = 20-40um, for an unsintered powder metallurgy produced alloy part for an alloy that sinters around 1700K, a Ra = 4um surface is easily obtained in minutes to an hour of non-line-of-sight surface e-Ion "deburring" operation. Multiple parts can be made simultaneously. The production cost saving per part when comparing labor time for 1 hour vs. 3 days is substantial. The savings from lessened environment degradation is substantial. The energy savings per year could be thousands of dollars in benefit. Please contact MHI for more precise calculations and to work with you to ensure best amortization cost for your specific location. Please Contact Us for more information for the best surface-finish for metals, ceramics, glass, oxides, garnets, silicon carbide and many other materials that require nanoscale or microscale smoothening or manipulation. A high energy and high velocity e-Ion Plasma™ CleanElectricFlame™ is shown below which can be used for in-situ surface operations within seconds or minutes for the completed biomedical part (entire surface), casting, forging or powder-metallurgy fabricated parts. Curved and non-line-of-sight regions can be treated. Other texture properties: The ACF, the auto-correlation function is a measure of how similar the texture is at a given distance from the original location. If the ACF rapidly becomes zero along a given direction, the surface becomes“uncorrelated” with the starting measurement location. The Sal (also called ACL or ß), is the Auto-correlationlength, a measure of the distance over the surface such that the new location will have a minimal correlation with the original location. For anisotropic surface texture, the direction along the surface for the ACL is the one which has the lowest ACL value. The STR which ranges from 0-1, for anisotropic to isotropic ia a measure of the spatial isotropy. Spacial isotropy STR~1 is good feature to have except in certain directional tools. The word “lay” is also used in the metal machining literature to indicate surface anisotropy but this best to have at a repeatable heirarchical scale acrooss many lenght scales. Contact MHI for more information on Shannon and other proofs and how we can recommend technology companies that can do measurements for you. The value of hardness depends on the material and processing conditions. The measurement of hardness also depends on the strain rate sensitivity on the harness and thus the measurementof Hardness is not always representative of a hardness during use in dynamic consitions. Please contact MHI for high hardness, low distortion and tunable coefficient of friction surfaces with the highest Str. Deburr anything. Very useful for oil pipeline and pipe-threads. "Deburr" steel parts and create nano-isotropic surfaces in a few seconds. Simultaneously nitride or oxynitride as required. 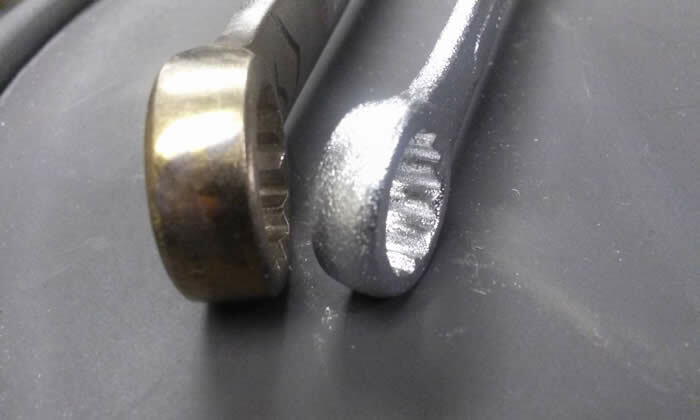 On the left is nitrided and deburred. On the right is the surface before the duburring. Typical Size/Footprint: A typical ~ 14 kW Cascade e-Ion Plasma™ configuration fits on half a standard desk-top table. Plug and Play type installation. Expected operating cost is a few cents per part but please Contact Us for your specific application. Stainless Steel, High density plastics, dental alloys, gold alloys, superalloys, Nitinol oxide conditioning, Ni-Ti, Ti-Al, Ni-Al, castings, forgings and many others where roughness needs to be reduced or surfaces have to be peened. Before e-Ion Ra= 20um » After treatment Ra= 4um surface shown above. No burrs.